This winter saw a series of frustrating server outages for smart thermostat owners, particularly Nest and Ecobee. Frequent outages make it difficult to use the thermostat the way most people want to: remotely through an app. Smart thermostats have two important jobs: be a thermostat and be online, so when the servers go down and that feature is lost, it’s easy to feel angry and frustrated. In this article, we’ll talk about why smart thermostats need a server in the first place, the outages of Winter 2019, what features are lost during an outage, and what to expect in the future from the companies that make smart thermostats. Why does a thermostat need a server, anyway? Nearly all smart thermostats communicate regularly with a server – a computer somewhere (probably) far away from your home – over the Internet. The server is how a request to raise the temp from your phone gets communicated to the thermostat itself. Even if your phone and the thermostat are on the same network, requests made via the app are sent through the company’s servers as a sort of “middle man”. This is a common criticism of smart thermostats. The lack of a “local network” alternative to fall back on during outages makes the devices almost completely dependent on the company’s servers, even when your phone and the thermostat are on the same WiFi network. During a server outage you won’t be able to alter the schedule or the current temp unless you’re standing at the thermostat – your phone/tablet/computer are now useless for controlling it. In a perfect world most users won’t notice a server outage. Smart thermostats are designed to be scheduled and then forgotten about, more or less. Outages are most noticeable to people who are opening the app frequently to monitor their home from somewhere else. The frustrating part of a server outage is the loss of remote and “smart” features. Any feature or action that would normally go through the server stops working when the servers go down. When the servers go down, smart thermostats become old school thermostats that can’t be operated from an app or website.
.@ecobee your servers seem to be down again. I’m tired of seeing this message. Fix your servers or I’ll fix the issue by buying a Nest. The servers are down with @ecobee AGAIN. That's like 3 times in the last couple weeks. So mad that I moved to @ecobee from @nest. These customers have a valid argument: being able to monitor and adjust the thermostat remotely is a major selling point for smart thermostats, so it’s frustrating when those features are disabled – especially if it also happens to be the coldest day of the year. Ecobee announces its planned outages on Twitter and r/ecobee. How big of a problem are server outages, really? It depends how you want to use the thermostat. For anyone who wants to “set it and forget it” outages shouldn’t be a problem because the thermostat can continue to communicate with your HVAC system without checking into any server. The only real loss of functionality is the ability to control the thermostat from your phone. If you’re happy with your schedule, though, you may not find yourself doing that very often. If you want to use a Nest or an Ecobee to monitor a home’s temperature while you’re away, though, your annoyance level may run higher in event of outage. You’ll be flying blind anytime there’s an outage. The thermostat should keep running your schedule, but in event of exceptionally bad conditions you may want additional peace of mind. We once pointed an inexpensive Yi camera at a large thermometer in a house we weren’t living at but wanted to monitor through a winter – sounds silly but it worked. In our own testing and trial runs with thermostats from Nest and Ecobee, we didn’t encounter any major outages. We’re very “set it and forget it” though, so once we had a schedule we liked we didn’t keep logging into the app. 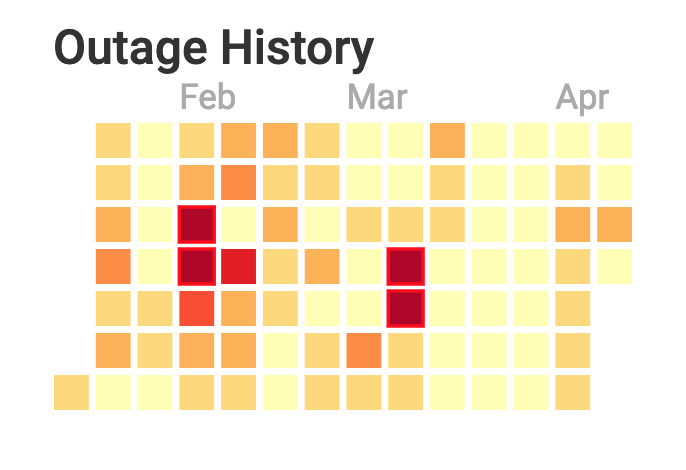 Many outages and scheduled downtimes went unnoticed by us. Who has the more reliable servers? On April 11, 2019 we visited outage.report and took these snapshots depicting the last ~4 months of server outages for Nest and Ecobee. The worst day is January 29, 2019 with 825 reports. 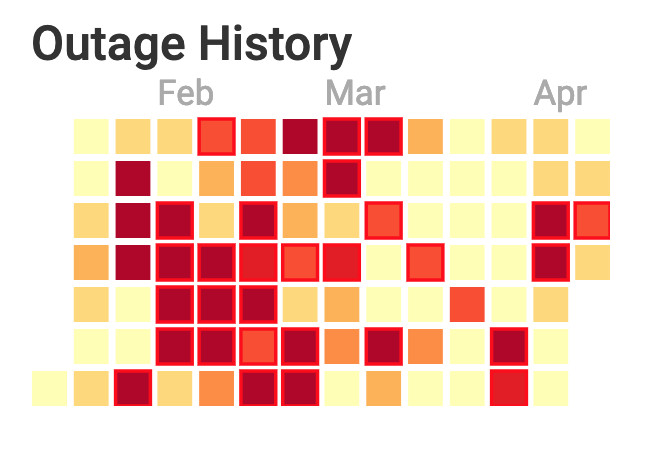 I thought this looked pretty bad, but then I took a look at Ecobee’s outage history for early 2019 – yikes. Here, the worst day is January 21, 2019 with 521 reports. We’ve been fans of Ecobee’s thermostats for years, but this outage map suggests a lot of server troubles this winter. Ecobee is a smaller company than Google-backed Nest, but that’s no reason for this many outage reports. We’re disappointed and hope Ecobee is making investments in its overall server stability. If you’re trying to decide between a Nest and an Ecobee and accessibility through the app and overall uptime are a major concern then you may find yourself happier with Nest. Previous: Previous post: What is geofencing and how do smart thermostats use it?